Today, we attempt to answer exactly 16 questions based on BeerAdvocate’s Top 250 rated beers. Q1. When we talk about “the Top 250 beers,” exactly how much competition was there? In other words, how many beers did the Top 250 beat out? Like 1,000 other beers? 2,000 other beers? A1. Close. There were 210,023 beers listed on BeerAdvocate as of February 2018, so the Top 250 beat out 209,773 other beers. 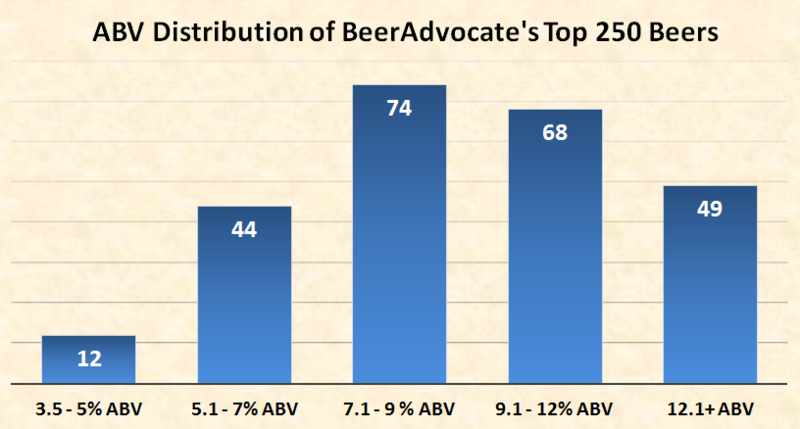 This means that the Top 250 represent the top 0.12% of all beers listed on BeerAdvocate. Not too shabby. Q2. Talk about cream of the crop. Here’s an easy question: Which beer was # 1? A2. That is an easy question. The highest rated beer in the Top 250 was Kentucky Brunch Brand Stout, which is a 12% ABV American Imperial Stout from Toppling Goliath Brewing Company. Marshmallow Handjee (Bourbon Barrel Aged Vanilla Bean Dark Lord) – 3 Floyds Brewing Co.
5. Marshmallow Handjee (Bourbon Barrel Aged Vanilla Bean Dark Lord) – 3 Floyds Brewing Co.
8. Bourbon County Brand Coffee Stout – Goose Island Beer Co.
Q3. Huh, seems like big boozy stouts and Double IPAs dominate the Top 10. Can’t say I’m surprised. 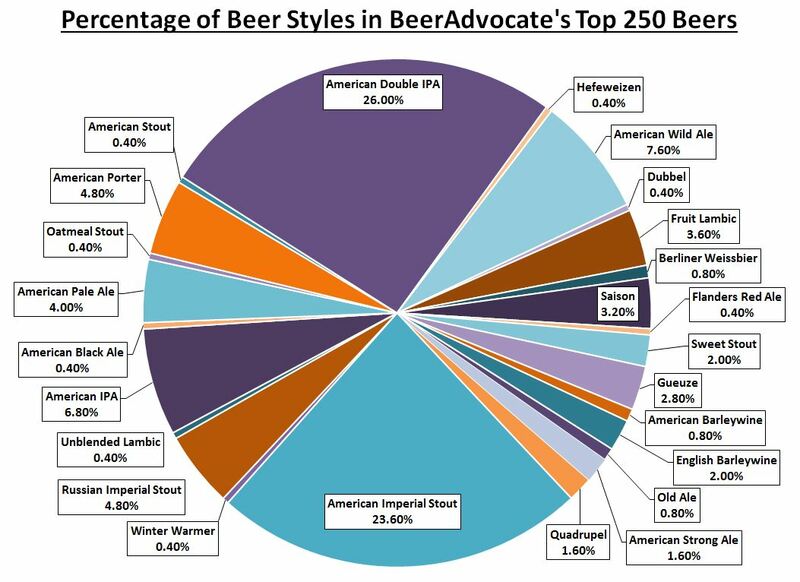 Speaking of which, what are the most popular beer styles in the Top 250? A3. Keen observation… and get ready to be not surprised again. As you can see in the handy chart below, it turns out that the two most represented beer styles in the Top 250 were American Double IPA at 26% and American Imperial Stout at 23.6%. Together, those two beer styles make up nearly half of all beer styles in the Top 250. The eight next most popular beer styles in the Top 250 after Double IPA and Imperial Stout were American Wild Ale (7.6%), American IPA (6.8%), Russian Imperial Stout (4.8%), American Porter (4.8%), American Pale Ale (4%), Fruit Lambic (3.6%), Saison (3.2%), Gueuze (2.8%), Sweet Stout (2%) and English Barleywine (2%). In a six-way tie for the least represented beer style in the Top 250 with only one example from each category, you have Flanders Red Ale, Belgian Dubbel, German Hefeweizen, American Stout, Winter Warmer and Unblended Lambic. Q4. Got it. So if you want to be in the Top 250, then it helps if you’re brewing big boozy stouts and Double IPAs. Sounds like a plan. Speaking of beer styles, I’m curious, how many beer styles are there in total? A4. Well, BeerAdvocate lists a total of 104 different beer styles, and of those 104, only 25 were represented in the Top 250, which were largely dominated by… you got it… Double IPAs and Imperials stouts. There are definitely more beer styles out there than those that appear on BeerAdvocate’s list, but as the greatest comedian of all time, Larry the Cable Guy, once said: it is what it is. Q5. Obviously Kathy Griffin is the greatest comedian of all time, but back to beer. It seems like the most popular beer styles (American Double IPA & American Imperial Stout) just so happen to be a bit on the boozy side. Do you have any data that shows how alcoholic the beers in the Top 250 are? Turns out that the average ABV of all the beers in the Top 250 is 9.6%. In the spirit of thoroughness, two of the beers in the Top 250 didn’t have an ABV listed, but seeing as how one of those beers was an Imperial stout and the other an English Barleywine, it’s probably safe to say they didn’t bring the average ABV down. Q6. Booze sells I guess. I noticed that the top two beer styles (American Double IPA & American Imperial Stout) are, as their names suggest, American styles of beer. Can you tell me how many beers in the Top 250 are from American breweries? A6. Another good question. 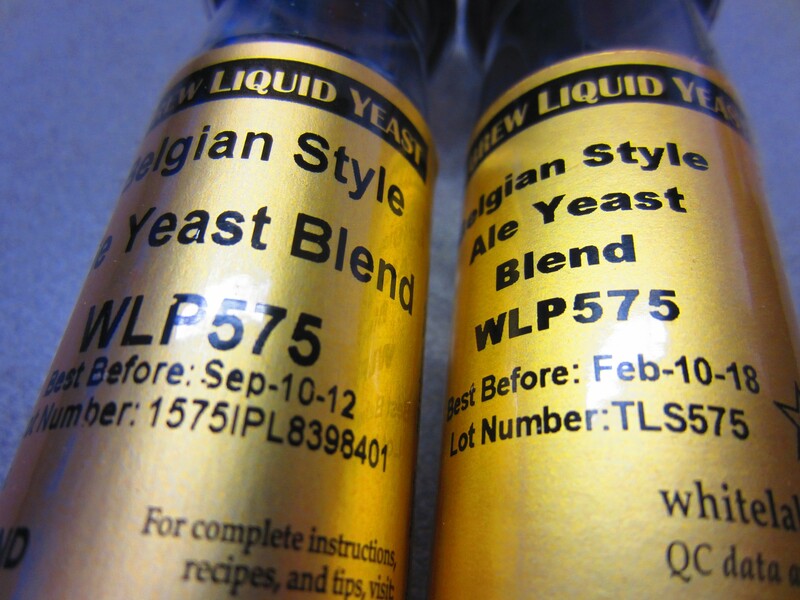 Of course, brewing a certain beer style isn’t country-specific, meaning that basically any country can brew any beer style it wants— Well, with the questionable exceptions of the quasi-protected appellations of Old Gueuze and Kölsch which allegedly can only be brewed in Belgium and Cologne respectively, but who’s counting. Anyways, the point was that just because the top two beer styles happen to be American styles, doesn’t necessarily mean they came from American breweries. But that fact had minimal impact in this case. Only 5 out of the 124 American Double IPAs and Imperial Stouts in the Top 250 were brewed by non-American breweries (2 from Canada and 3 from Denmark to be specific). Q7. Fair point, but you didn’t exactly answer the question about how many American-brewed beers there were in the Top 250. 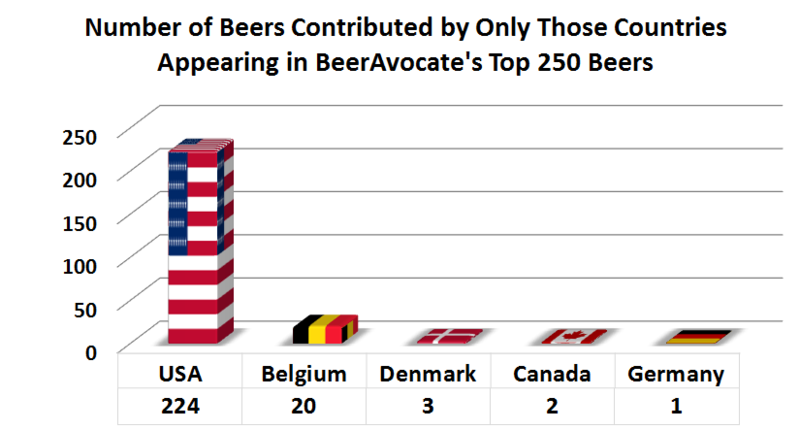 How about you just tell me how many beers in the Top 250 came from whichever countries. A7. We’ll do better than tell you, we’ll show you! And also tell you. As the country-coded 3-D chart below shows, 224 of the Top 250 came from the U.S. After that, Belgium came in second with 20, followed by Denmark with 3, Canada at 2, and Germany with a grand total of 1. In other words, American-brewed beers represented 89.6% of all beers in the top 250. 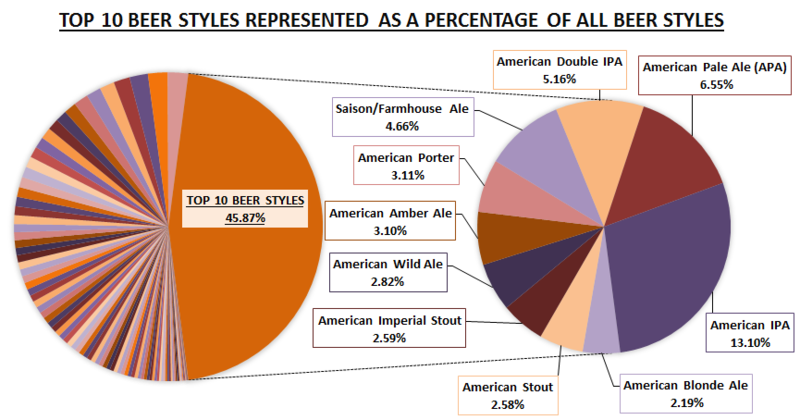 On a side note, 55.87% of all beer styles in the top 250 were American styles. 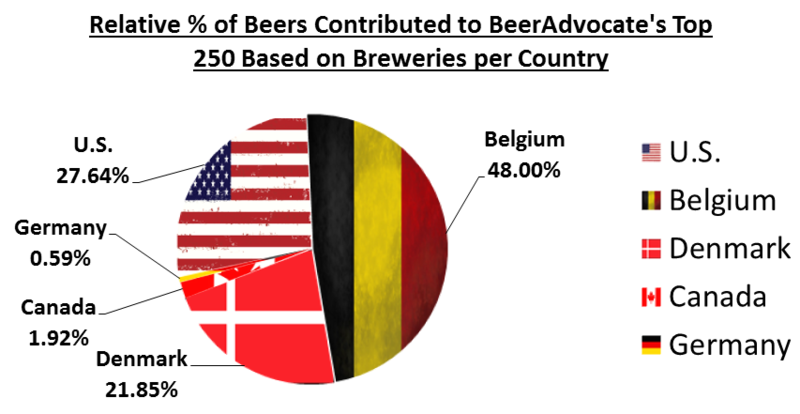 So if 89.6% of beers in the top 250 came from the U.S., this seems to suggest that American breweries are beating other countries at their own game. Q8. Geez, it looks like the U.S. is really crushing it when it comes to beer. I wonder if the number of breweries in each country has something to do with it. I mean if there are more breweries in the U.S., that might increase the chances of American-brewed beers appearing in the Top 250, right? Q9. Okay, the U.S. isn’t # 1 anymore after looking at the numbers proportionate to the number of breweries there are per country. But I’m still interested to see how the individual states in the U.S. did comparatively. Got anything for me? A9. 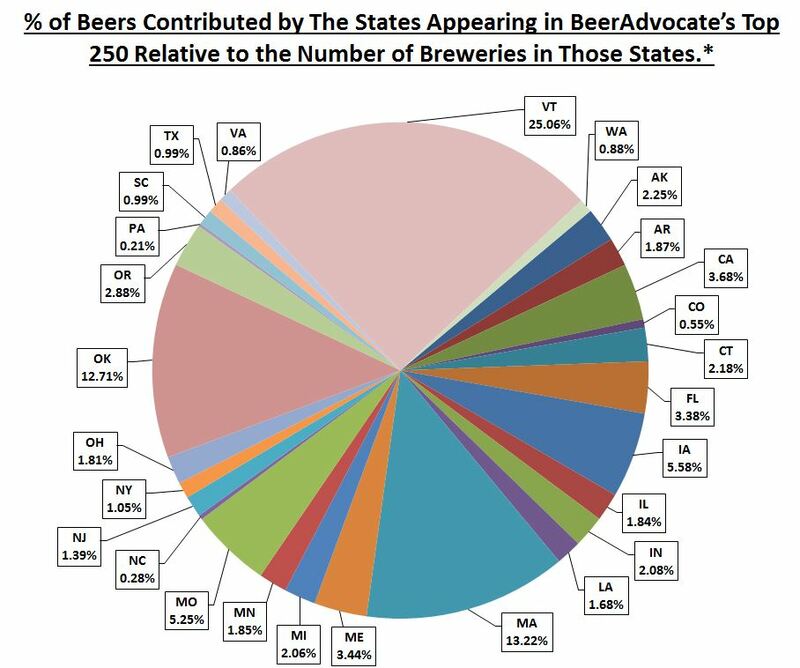 How’s about a big fat color-coded pie chart breaking down the percentage of beers in the Top 250 from each state. And yes, we excluded non-American contributions from the chart… that’s what that little asterisk at the title of the chart is about. 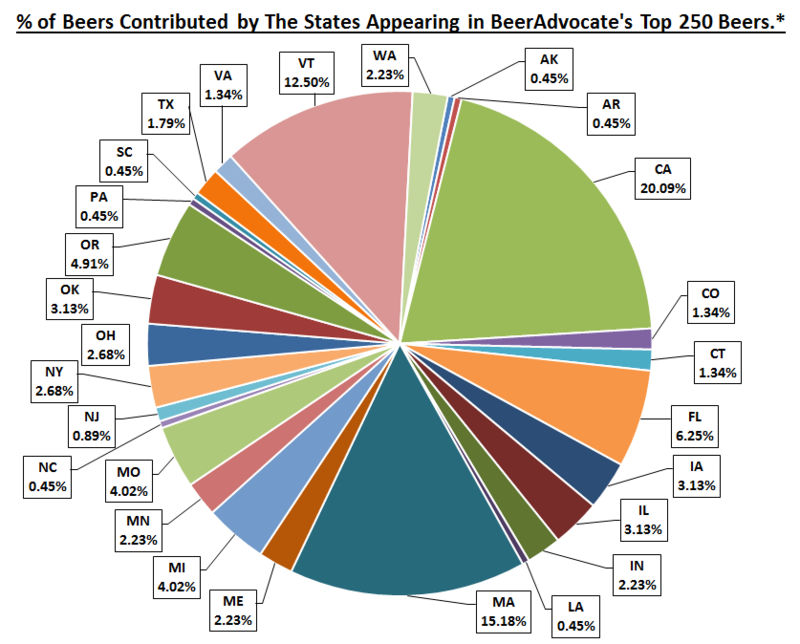 As you can see above, there are 27 states with beers in the Top 250. The states with the most beers in the top 250 were California with 45, Massachusetts with 34, Vermont at 28, Florida with 14, and Oregon with 11. Q10. Yeah, of course there’s going to be more beers in the Top 250 from California because California has the most breweries in the U.S. So how would things look if you adjusted the numbers relative to the number of breweries per state? So, as you can see, once you account for the total number of breweries in each state per number of beers in the Top 250, it turns out that California is no longer number one. It’s not even in the top 5. The new picture looks like this: Vermont in first place with 25.06%, followed by Massachusetts at 13.22%, Oklahoma with 12.71%, Iowa at 5.58%, Missouri with 5.25%, and then California with 3.68%. Q11. Ok, so you relativized the data according to the number of breweries in each state, but not all breweries produce the same number of beers. Can you relativize these numbers based on how many beers are produced by each state? A11. Let’s see, so there’re 800 breweries in California alone, and 4,661 breweries in the other 26 states in the Top 250, so… uh, this is gonna take a while. We’ll get back to you on that one. Q12. Alright, maybe I was getting a little greedy with that question. Just for fun though, how many beers were contributed by each region of the U.S., according to how the U.S. Census Bureau defines the regions, of course. A12. Obviously we were going to use the U.S. Census Bureau method for defining regions of the U.S. That’s like the gold standard, or whatever standard the U.S. is pinning the value of its currency to nowadays. Anyways… here’s another chart. With colors. And shapes. Q13. You know, here I am asking all these questions about the different states and beer styles, I forgot to ask about the breweries themselves. Were there many breweries with more than one beer to make it into the Top 250? A13. Yes. In fact, there were only 86 breweries contributing beers to the Top 250, which means there were several, or more specifically 45, breweries with more than one beer in the Top 250. The average number of beers contributed by only those breweries in the Top 250 was 2.91. Q14. Okay, so 2.91 was the average. Were there any outlier breweries on the list? Like breweries with a statistically high number of beers in the Top 250? A14. So this is where things are about to get a bit more interesting. To answer your question, yes, there were a few outlier breweries in the Top 250. To keep things in prospective, remember that there were 210,023 beers listed on BeerAdvocate when we ran the numbers mid-February of 2018, so for a single brewery to have multiple beers in the Top 250 is pretty impressive on its own. But if you’re asking for extreme outliers, there were two breweries in particular that caught our eye. Hold on to your hat because both Hill Farmstead Brewery and Trillium Brewing Company each had 20 beers in the top 250. Them’s what we call some significant outliers. Q15. 20 beers each?!? Seems like a WTF is in order. Tell me you guys dug into those curious sounding numbers a little bit more, right? A15. Yep. But to get that information, you’ll have to pay us money. Just kidding! As Bill Gates once said, information and all the time it takes to compile and analyze should be free! So in the spirit of the Freedom of Information Act, we’re going to share those juicy details with you free-of-charge. But first, you see that big cliff right over there? A16. The cliff you’ll have to hang onto until next time. What is the most and least popular beer style in the world in terms of number of commercial examples? Which type of beer is more popular: lager or ale? Which country has contributed most to the number of beer styles in the world? To attempt an answer at these questions and more, we analyzed data from the popular beer rating website BeerAdvocate and provided the results below. 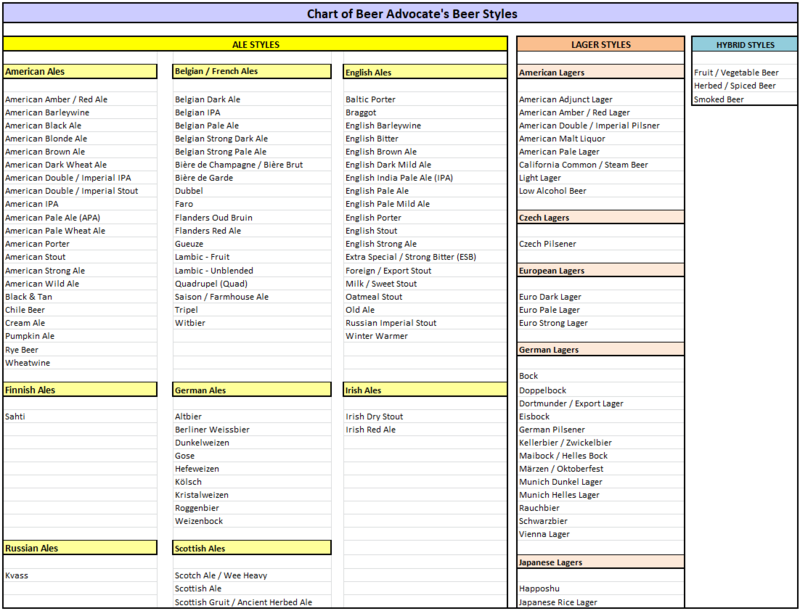 That said, BeerAdvocate arranges all of the beer styles it’s identified under three main categories: ale, lager and hybrid, as shown in yellow, pink and blue respectively in the chart below. 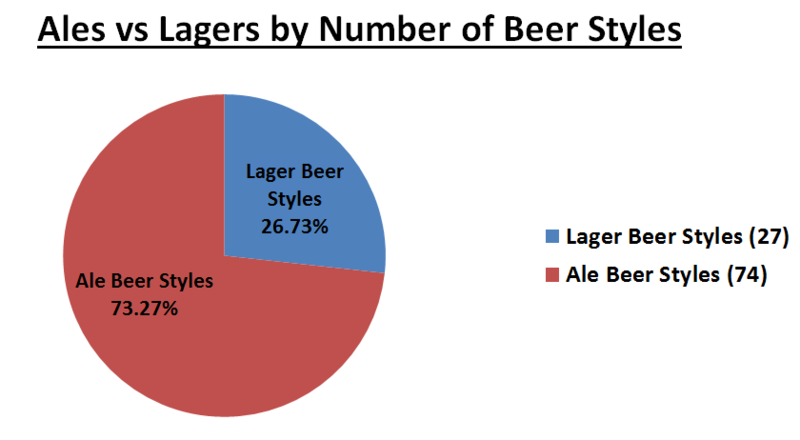 As shown in the chart above, the main “ale styles” and “lager styles” categories are further sub-categorized primarily by the country in which a particular beer style originated. When a given commercial beer is reviewed on BeerAdvocate, that beer will always be associated with a given beer style. For example, if one were to review “Guinness Draught,” it would be associated with the “Irish Dry Stout” style of beer. Interested to gauge the current landscape of beer styles and their popularity, we took a quick look at the total number of commercial beers listed under a given beer style on BeerAdvocate’s website. First we reviewed the list of beer styles arranged in order of the greatest number of commercial examples of a given style. The chart above lists 104 different beer styles with a grand total of 210,023 different commercial examples of those beer styles. By far, American IPA is the most popular beer style in the world in terms of commercial examples brewed (27,515). Rounding out the bottom of the list sits the sweet and sour Belgian Lambic style Faro with only 20 commercial examples to its name. The chart above shows that there are in total 27 different kinds of lager style beers (26.73%), and 74 different kinds of ale style beers (73.27%). And while lager styles make up only about a quarter of all beer styles compared to ale styles, it should be noted that one particular style of lager, namely American Adjunct Lager, dominates all other beer styles in terms of global production by volume. The chart below takes a closer look at lagers and ales, and indicates that there are 27,197 different commercial examples of lager beer (13.39% of all commercial examples), and 175,818 examples of ale beer (or 86.60% of all commercial examples). Part of the dominance of ale type beers over lagers may have to do with the fact that commercial lagers typically take longer to produce, and are therefore more cost-intensive as compared to most ales. 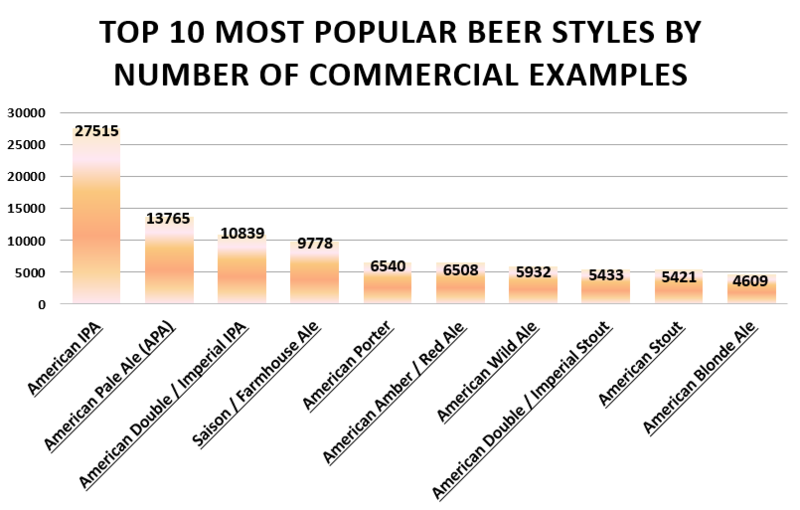 The chart below shows the top 10 most popular beer styles by the number of commercial examples listed on BeerAdvocate. Again, American IPA dominates the beerscape with 27,515 commercial examples produced, outpacing its next closest rival, American Pale Ale, by a whopping 13,750 commercial examples. 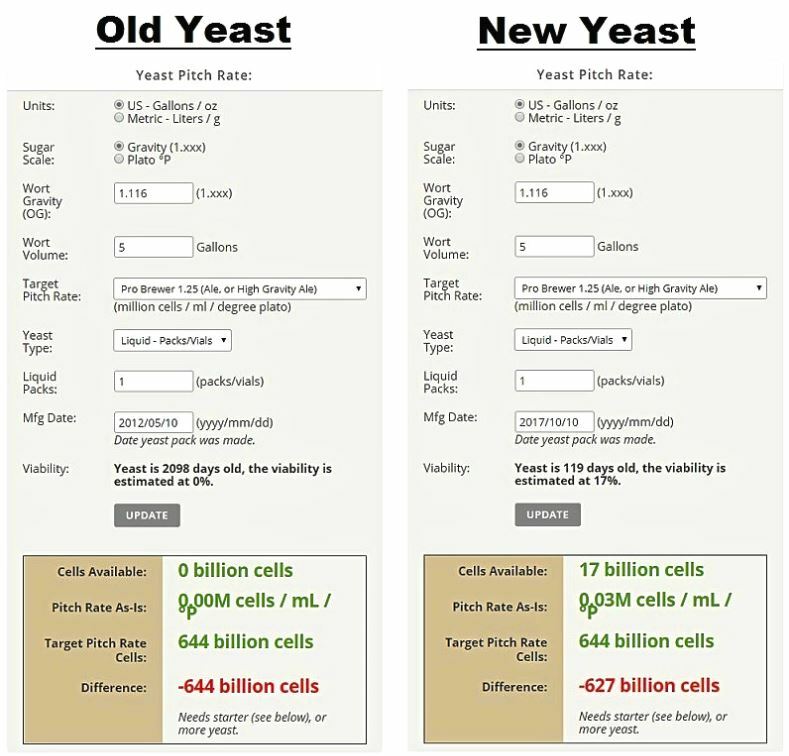 The chart below takes a closer look at the top 10 most popular beer styles with the pie chart on the left representing all 104 beer styles, and the chart on the right showing a magnified section of the top 10 beer styles. Interestingly, the chart above shows that the 10 most popular beer styles comprise nearly half (45.87%) of all beer styles, including hybrids. To put it another way, of all the 210,023 commercial examples of beer listed on BeerAdvocate, 96,340 belong to only ten different beer styles, suggesting that although there is a great diversity of beers styles (104 listed styles), there are much fewer commercial examples of this diversity actually produced. Also of note, the data above reflects that 9 out of 10 of the top 10 beer styles are American beer styles. To attempt to explain this seemingly lopsided beerscape leaning in favor of American beer styles, let’s consider a few more data points including beer style data and analysis per country to see if American styles are simply crushing it, or if this is all just a numbers game.